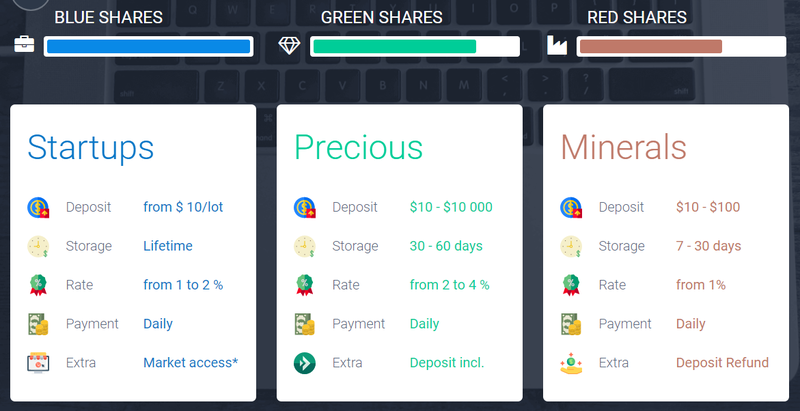 Tokenizer is quite attractive project thanks to decent daily earnings which is not little and not too much, but minimum 5% on business days and 2% on weekends till we reach 150% ROI. We can deposit via BTC, ETH, LTH and BCH. 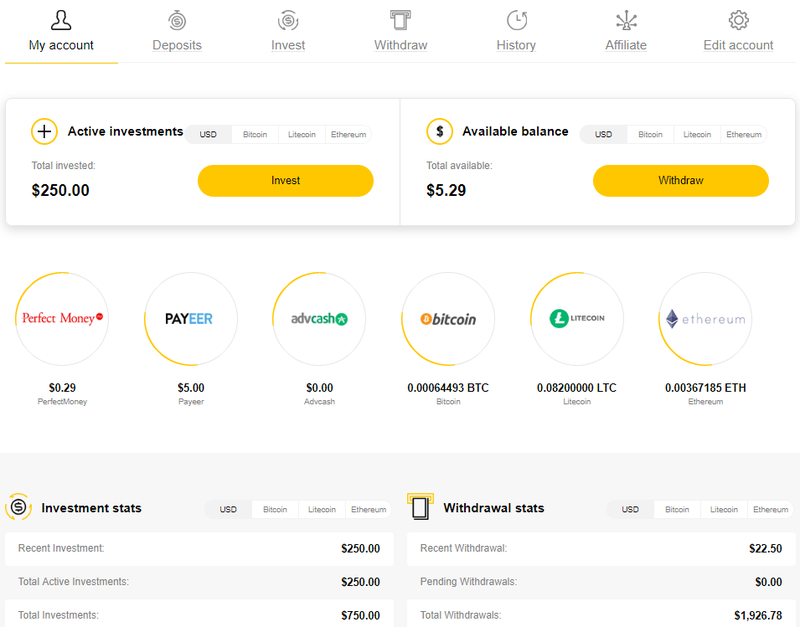 Withdrawal limits: 0.00112BTC, 0.0025ETH, 0.0041LTC, 0.00041BCH. This is why I wonder how can some RCB hunters claim less than the minimal withdrawable amount. Of course my income is always higher, so I do not have problem to withdraw these teeny amounts, just I do not think that it is fair. This is why I added to RCB rules that the min. rcb value must be higher than 5$ if the deposit was made via coins. I will start to practice this rule and will check the votes as well because I think saying your opinion is worth once you get rcb, mainly because it can help to others. I am not interested to hear how cool is rcb, but your opinion about the project. This is big difference. Tokenizer isn't brand new project, started 48 days ago, but still alive while others fail. I think most of us earned nice money already - who invested in the beginning. And if you reinvested, the next BEP is close again, so I can just congratulate. Keep this project alive! - but invest only what you can afford to lose! 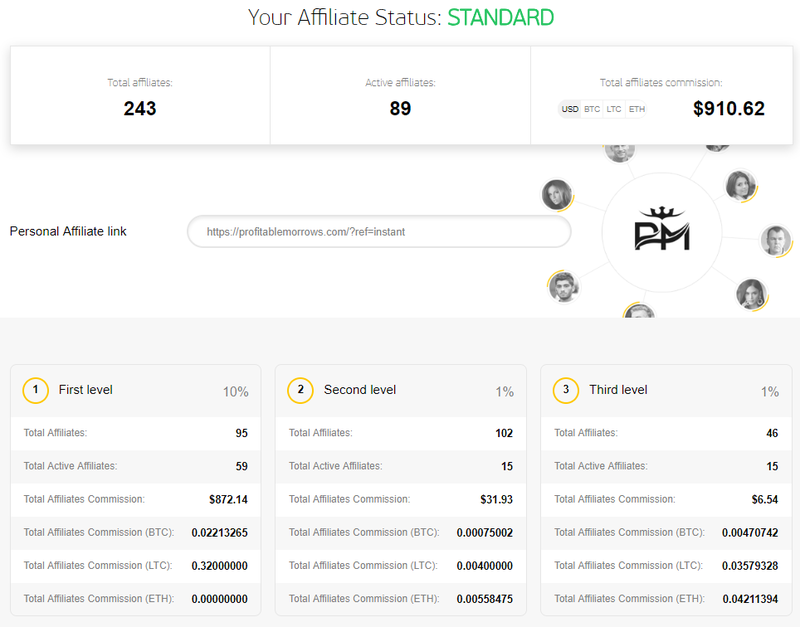 The first level of referral commissions pays 10% and the second 5%. At least this is good attraction point for promoters since the earnings in low-ROI long-term projects aren't attractive for hyip players at all. Maybe it can work on "newer" markets or for new wave of newbie investors. We can deposit via most frequent coins like BTC, LTC, BCH, DASH, ETH, XRP, ZEC. The BEP is reachable within 17 weeks, which is quite long time (but WestlandStorage is not hot&fast project) and then everything over this is our profit. If you prefer to get your principal back at 50% fee, you need to wait more than 8 weeks to do not end with loss. One thing is still not working, but it is negative just for those who would like to track referral commissions. The links do not work at all, so we can't know who invested and also can't see the hash/batch numbers (maybe just Chrome? - but this is the most popular browser). The admin promised to fix it 3 times, nothing happened. 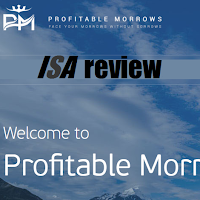 ProfitableMorrows has joined ISA in January this year, so it is absolutely not new project, but still alive while other big projects are in trash already! I am sorry that I haven't written reviews in these months, but this season was the worst ever in hyip industry. Even after the closure of LibertyReserve was better to play hyips than these months. I still think the reason is/was btc-boom, but it is not really important when we talk about ProfitableMorrows! The dashboard is absolutely userfriendly, some programmers (or admins ;) should learn how to keep this level without complicated or hard to find functions. 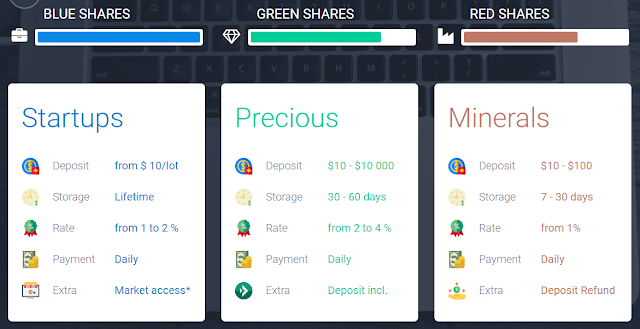 As you can see currency types are handled separately, so you won't have headache if you prefer to invest via coins. Your money won't be converted vice-versa like in cheaper, mostly goldcoders based scripts. 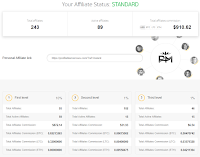 I can show you my referral stats as well. Yeah, nothing extra, but in this season it is still OK, mainly because most of investors are scared to reinvest and/or rather join under RCB monitors to maximize the ROI if the project is not insured here. SSL certificate from Comodo expires in 67 days, hope the admin will extended it soon. But we do not have to be worried about domain expiration, it is paid till 2027! If you would like to hear and see how it works, you can watch promo videos. + PM has live Telegram and Twitter channels as well. The question is: is it still worth to invest or is it late now? I guess nobody can answer this question, only the admin. Nothing is safe on the net. 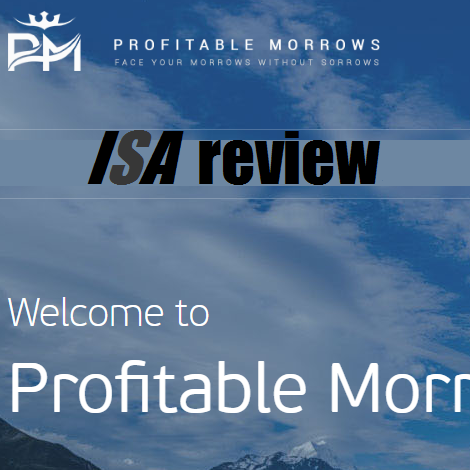 I just wanted to say with this quick review that the admin of ProfitableMorrows does very good job, mainly in this season when all competitors are failing fast. Thumbs up one more time! Too many unmissable opportunities are coming with craziness around BTC. One of them is tokenpay. The site looks good, including their promises, bonuses, possibility of further growth, etc. Lot of advertising and spammers make such opportunity visible and attract investors. Of course hackers, cheaters are ready to cheat in all cases, but if it is managed by the staff inside the project, then we can do nothing. I think my case is not unique, and many investors lost money and access to account already. I decided to publish my story because tokenpay ignored me x times, so I donated them with 0.1BTC. Hope some people will rethink investing there. When I checked the transaction in my userpanel I was shocked when I noticed the displayed email address, it was not mine! I am not a newbie, there were not fake URLs, so it is unbelievable. By the way I was forced to download and install their app, but why? - this app was not linked to my account, but it was not really suspicious, because then I was able to purchase and send the money to a generated address in my userpanel. 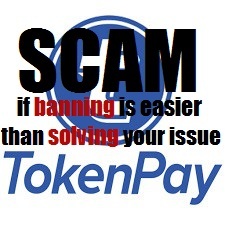 I emailed tokenpay at support@tokenpay.com, compliance@tokenpay.com. Contacted them on Facebook in private message and on their wall as well. I did not receive any answer, just a reaction(question) on the wall, but on the next day I was banned and I am still not able to post anything on their wall. I contacted Sigdel Sabita as well, explained the situation and said her that it is enough to send 0.09btc back without the bonus (+300tokens). I was surprised when she agreed and said that she will send it back. Then I sent 3 mails and after one week I got an answer that she was in hospital, but checked the transaction - already returned the money. Of course I did not get any money. Then she answered quite fast that the money is no longer available on her user balance. Have I believe her? By the way tokenpay published in one of early newsletters that they know about hacking attempts, and just after some newsletters reacted again that they already handle the situation. They said that if somebody can't log in, just create another account. Wow, is this the solution? Are they as amateur that they do not suppose that somebody had money on it? I recommend to avoid Tokenpay and think twice before investing in similar unmissable opportunity. Yeah, the insurance is so high and the name of the project is well known. 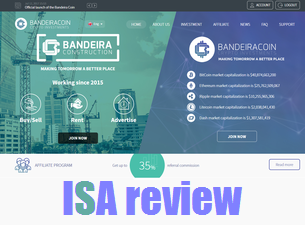 This is not a secret that it is managed by the admin of bandeiracorp.biz, so if you missed this great project and hesitate to invest now, maybe you will like bandeiracoin.com - the new alternative. But why to run 2 projects in the same time? I have no idea, but the admin will earn nice money in the end of the game, this is sure. No problem at all, since bandeiracopr.biz is 500 days old today, so thumbs up for him, the industry needs such admins! Here you can get min. 0.75% average daily on business days, up to 40% monthly, no expiration. Principal back after 50 calendar days without fee. You can invest via PM, PY, BTC, ETH. 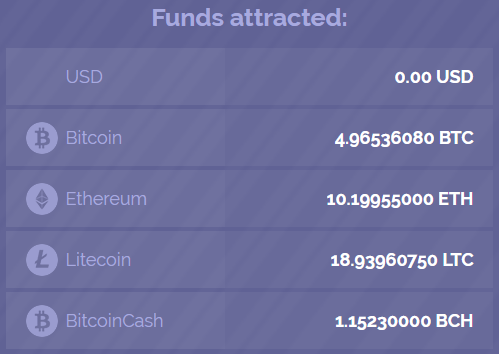 Advcash is also visible, but it isn't active yet. I thought the admin will solve this issue within few days, but it seems this is greater problem. I also reported few bugs, for example Read more button on the main page, but was not fixed yet. His old project also contains few bugs, so this is not a problem, just annoying fact. There is a marketing trick if you see this details on the main page: "Get up to 35% referral commissions" - do not believe that you get 35% from deposit of your referrals. As a basic investor you can get just 3% from first and 1% from second level of your downline. Moreover, 2% from earnings of your first level referrals every day. There are strong requirements to get higher referral commissions, so the highlighted 35% on the main page sounds good, but more or less it is just marketing trick. I invested 500$ in Bandeiracoin, and hope that it will be similar success project like the original project. But please note, once any of these projects stops paying, it will mean the end of the game for both. So do not be blind, always accept the risk if you play hyips. My overall opinion is positive, once again, thumbs up for admin. CORE+ has purchased Premium listing on 8/Jun. The insurance was active for 20 days (1400$ PM), but the admin upgraded it to R5 section on 30/June, so the insurance was extended and increased by 600$ PY for another 20 days. Great template and user panel, unique script, reasonable investment plans. This is what Core+ offers. Of course there are some things to discuss, but our overall opinion should be positive. * possibility of selling on the p2p market. You can sell these shares at any price without limitations. All funds received from sales will be credited to your account and are available for withdrawal. So once you earned some money, you can decide to sell your investment. Of course it is not automated, so somebody have to buy it to get money. This is why setting reasonable price is important in this case. I do not know that the investment generates any earnings while it is not sold, but probably not. But back to basics. 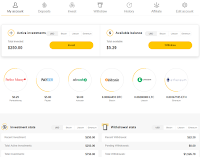 Please note, first you have to top up your user balance (money icon - top right corner), then you should invest from the user balance - but just in predefined amounts, so check these amounts first, then decide. I think it is not investor friendly option, but it is about "shares". Regarding user panel of Core+, it is really nice, but so different from another scripts. I miss "withdraw" and "top up" buttons from the main menu. The admin wanted to create not overcomplicated stuff, but handling the most important transactions (top up, withdraw) through the smallest icon is questionable decision. No problem at all, you just have to get used to it. 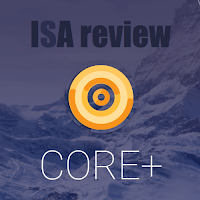 I think Core+ has good potential, but the success will depend on admin. If he will able to involve big markets (since the English market is so weak), then the game can be played longer than usual. At this stage I can show thumbs up. Roly Investment LTD has purchased Reserved 5-star listing on 20/Jun. The insurance is active for 30 days (1.1588BTC). Roly was temporarily downgraded to Premium due to missing usernames of referrals. This was mainly RCB related issue, but the admin fixed the problem within a day, so Roly is present in R5 section again (23/Jun). As you can see Roly is powered by unique script and has great template. This is always liked by us, so the only question is, does the admin have good intention? We can't answer this in 99% cases... But we can see a trend of insurance. I was who spread this trend among hyip monitors/bloggers and now it is starting to be popular among hyip admins as well. The admin at Roly claims that your investment is insured if you click on the button, just the earnings will be lowered by 5%. Do not believe in such things, nobody saw the amount, but by choosing this option, your earnings will be less for sure. In the end of investment plan (365 days) you can get 80% of your deposit back. It is not really important in such market situation. I think all we can be happy once we reached the BEP, then it is about the volume of profit. This is why I hope that the admin is a good manager and able to focus on another markets as well, since the English market is weak still. If just hyip monitors will be hired, then no miracles will happen. It is good to see that Roly is available via 20 languages, and the level of translations is not so bad. This is big advantage, just I do not like that once I must select the desired language each time. The withdrawals are processed instantly, just the speed of network confirmations dictates the time when you are really paid. You can withdraw just 3 times a week: Monday, Wednesday, Friday. I can't understand this option as an advantage, but at least the admin is different from others. 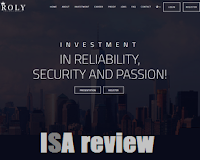 So, if you like Roly investment, join with my affiliate link and let's hope that the insurance won't be needed at all. 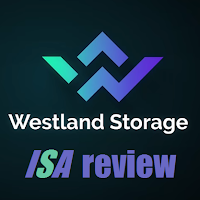 I hope you also know that ISA is having some reserves and now it is higher than $3k which is always available to cover losses from fast scams. Have a luck! Fexfund has purchased Reserved 5-star listing on 9/Jun. The insurance is active for 30 days (0.87663 BTC). Today it is monitored by ISA 17 days and reached 60 days of total lifetime. Great results in such circumstances! 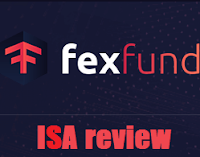 You probably know that I rejected Fexfund in the beginning just because the admin bought too expensive listings on the very first days even the project was not bad, but I talked with him more times and last time I realized that he is one of best hyip admins currently. I rarely accept those projects which are listed on DN and MNO in the same time, but this time it is absolutely disinterested since they probably reinvested just low amounts so the investors do not have to cover their high ROI anymore. The admin convinced me about his qualities, as a result I accepted his listing request. It is also clear for me that many of you are already in, or maybe will reinvest now, but it is my pleasure to monitor a project which is really worth in such market circumstances. Fexfund is powered by unique script even most of functions are known from GC or H-scripts. You should pay attention to some answers in FAQ. For example it is rare security measure on the market that you should wait a day to be able to withdraw again if you change your payment details in your profile. Good to know that BTC transactions are handled without conversion to USD, which is essential to do not loss due to different conversion rate. Withdrawals are processed instantly or within 24h in case of third party issues. I also recommend to click on News button, where you can see the office of Fexfund in Brazil. I am not sure how effective are such offline offices because 99% of the business is made online. It can be good just for few people who are skeptical enough to visit it and talk with the staff - and maybe invest larger amount, For everything else such office is unnecessary, moreover, costly. I haven't mentioned SSL or CH certificates, but I think it is basic level of seriousness in this kind of business. My general opinion is very positive, thumbs up for admin, but do not forget, invest only what you can afford to lose.